Have you Met Your Service Requirement? At the recently-held Sail Chicago annual meeting, I gave my final Treasurer's report and I must confess that I had some very mixed feelings. I've been on the Board for the past six years, three of those as Treasurer. I've been a vital part of some exciting changes in our organization during that time, and recent indications are that more significant changes will be coming in the not to distant future. I have really enjoyed the opportunity to help shape the future of Sail Chicago and, in some respects, I'd like to continue to be part of that effort. On the other hand, I know that, particularly in volunteer organizations, leadership can become stale if it's in place too long. That's why I decided not to run for a third term on the Board. New people bring new vitality and creativity to any organization, and this is certainly true of Sail Chicago. Replacing me as Treasurer will be Martin Modahl. He's been on the Board for a year and has been "in training" during that time. I know that he'll do an excellent job as Treasurer, and I'll still be around to back him up if he needs it. Our newly elected Board members will also make great additions to the team. Brian Johnson is our new Insurance Coordinator. He brings with him a lot of experience in the industry, and a real dedication to sailing. Bob Lapin has served terms on the Board twice before. He currently runs our Cruising program, and he has done a fine job at revitalizing it over the past couple of years. Shawn Lord has just re-upped for a three year term. He's been a real gift to our Maintenance program and has been actively helping our webmaster in making our website transparent and simple to navigate. Sarah Pellegrino is a relatively new face in Sail Chicago. She brings with her a real energy, enthusiasm, sense or organization, and a commitment to do whatever it takes to make our organization even better than it is. These dedicated folks will do a great job in helping to continually move Sail Chicago to the forefront of sailing in the Chicago area. And speaking of volunteering, remember that we are an all-volunteer organization and a community of people dedicated to promoting safe sailing. All of us need to chip in and do our part. Another article in this issue lets you know of specific areas where you can help out and fulfill your service requirement as well. Have you ever wanted to sail from port-to-port around Lake Michigan or learn the finer points of bareboat cruising so you can charter a boat in the Caribbean or the Mediterranean? Well, now Sail Chicago can provide you with the opportunity. Weekend and five day Bareboat Cruising courses will be offered in 2016 aboard Priorities, our Hunter 34. In order to qualify for the course, you must be a Cruising Skipper or plan to become one early in the 2016 sailing season. You must also complete an on-shore Coastal Navigation course that will be offered on the Saturdays of April 9 and 16 from 9 a.m. to 1 p.m. at an office location in the south loop. To learn the details of our cruising courses and the Coastal Navigation Course, click here. To register for the April 9 and 16 Coastal Navigation Course, click here. Questions? Contact me! HAVE YOU MET YOUR ANNUAL SERVICE REQUIREMENT? If you'd like more information on one of these or other open positions please contact our Volunteer Coordinator, Chris Garvey. 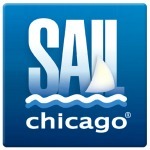 Now's the time to renew your Sail Chicago membership! Click here to log into your account. In the "Account Summary" panel on the right, where it says "Non-Member", click "Upgrade/Renew" and follow the instructions. Click here for help. I attended a very informative and useful seminar at the Strictly Sail show in January: National Weather Service Marine Products and How to Navigate the NWS Website, presented by Amy Seeley. Amy is an enthusiastic sailor and has been a National Weather Service (NWS) meteorologist for 25 years. A fairly new NWS product is the Great Lakes Weather page. This page includes detailed weather forecasts going out five days for each of the Great Lakes, with graphical forecast maps for hazards, wind speed and gusts, wave height and period, and temperature. This data is continuously updated so it can provide a near to real time forecast that can be extremely valuable to mariners. If you select Lake Michigan wind speed, for example, the display will step through the wind speed forecast in three hourincrements for the upcoming five days. This will give mariners an idea of the trend in wind direction and velocity as weather systems pass through our area. Since it is updated continuously, it can be more accurate than the nearshore marine forecast, which is updated every six hours each day. Amy also reported on the addition of a new nearshore buoy off Wilmette, IL, which will help improve the accuracy of the nearshore marine forecasts. One of the problems facing meteorologists who prepare the nearshore marine forecasts is the lack of adequate data upon which to base their projections. Joining nearshore buoys in Michigan City (Buoy 45170) and South Haven (Buoy 45168), the new buoy, Buoy 45174, is a welcome addition. All are currently out of service for the winter. You can find them at the National Data Buoy Center. The Great Lakes Weather page contains links to vast amounts of historical and current information of interest to all mariners. Amy also introduced a new experimental product, the Enhanced Data Display. This sophisticated tool allows users to plan custom routes on land and water by car, foot, bicycle, or boat and to obtain detailed forecast information for each stage of the trip. If you visit this page, check out the route planner at the lower left side of the web page. Click the drop down menu labelled "Public/Marine Forecast" to access the weather route planner. Once you enter a route, you can enter boat speed, draw a custom route, and generate a graphic showing estimated time of arrival along with the forecasted weather along the way. I am looking forward to using this great tool for preparing for offshore voyages on Lake Michigan this summer. I encourage you to visit the site, explore it, and provide comments to the NWS. Another good source of weather information is the "Hourly Weather Forecast Graph". The graph provides detailed forecast data on temperature, wind speed and direction, precipitation, sky cover, and relative humidity. 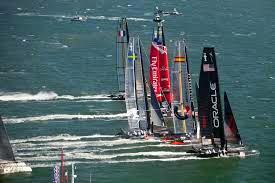 For the first time in its 164-year history, an America's Cup qualifying round will be held in fresh water - Chicago. Seven qualifying races are being held around the world to determine which team will challenge the defender, Oracle in Bermuda in 2017. The races will be held off navy Pier during the weekend of June 10-12. The boats are 45 feet long cats with wing like main-sails, they "fly" at speeds up to 35 knots. A Grandstand will provide the best viewing at the end of the pier. Check out the website for tickets and details. Sail Chicago has purchased a boat pass for Priorities that permits us to raft-up on the periphery of the race course to watch the races. More details to follow. 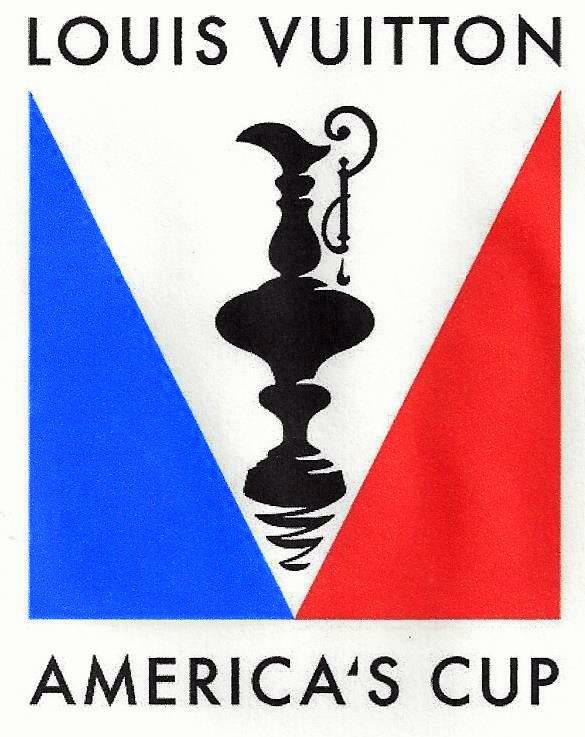 America's Cup is looking for qualified volunteers, who love customer service and supporting fans' needs, to work a minimum of two shifts between Friday, June 10th and Sunday, June 12th. There may be additional opportunities available before and after these dates as well. All volunteers must be 18 or over. If interested in volunteering, please apply here . Keep in mind, there may be specific roles that require a short phone interview. If needed, a representative from Chicago Sports Commission will reach out over the next several weeks to learn more about your skills and experience. All applicants will be notified of their status by mid-March. Accepted applicants will be able to select specific shifts at that point. On Wednesday, March 2, over sixty Sail Chicago members and friends gathered at the Chief O:"Neill's Pub and Restaurant to enjoy a meal together and to review the prior year's activities and learn of new plans and programs for the coming sailing season. After Chairman Chris Schuler called the meeting to order, Treasurer Steve VanderVoort reported that Sail Chicago ended a successful financial year with a strong balance sheet and a healthy net income. Matt Stuczynski, our Lead Instructor detailed plans for the Instruction Program during the upcoming sailing season. Maya Teleki discussed the expanded Colgate Racing Program now in its third year. 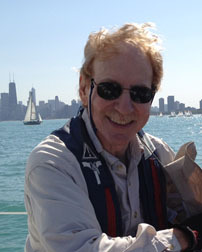 Tom Simms gave a report on Sail Chicago's sailing programs for disadvantaged youth. Four Directors were elected to fill vacancies created by expiring terms: Brian Johnson, Bob Lapin, Shawn Lord, and Sarah Pellegrino. Finally, the Board members present fielded questions from the audience members. Many lingered after the meeting was formally adjourned to socialize and make plans for the upcoming sailing season. Do you have a friend whom you've tried to interest in sailing but who just doesn't seem to get the joy and exhilaration you feel when you're out there with the wind in your face and your hand on the tiller. Well here's something that might help. U.S. Sailing has produced a video that captures some of what we all experience when we're out there on a sailboat. Share it with your friend, and perhaps they'll become excited enough to go sailing with you. An interesting app for iPhone and Android recently came to our attention. If you've ever struggled with trying to tie a bowline or were wondering what a sheepshank is, it might help. Chris Schuler, Matt Stuczinski and Michael Swisher reported on the information gained from attending US Sailing Leadership Forum. Their attendance helped to increase communication and form relationships with other sailing organizations. Instruction discussed putting a US Sailing "dryland" course online. In order to cover these costs, basic, intermediate and skipper prep classes will increase by $15. Mast raising on the Colgates are scheduled for April 23/24. Harbor opens May 1st. Class registration should open early March. Annual dues can be paid now. Racing seminar should be scheduled in March. Archived BTS go back to 2011. Service time still needs to be put on the website.